You've just been hired by Widget & Co. to prototype a new electrical circuit for their line of impenetrable puzzle locks. As part of this circuit, your boss asks you to invert three boolean inputs. "Easy", you say, until you look around the lab for parts. To your dismay you can only find two boolean inverters (NOT) gates. There's a big stash of AND and OR gates, but it seems the interns before you have taken the rest of the NOT gates. So! Design a circuit which uses at most two NOT gates, and an unlimited number of 2-input AND and OR gates, to successfully invert three inputs. I guarantee this can be done, and that this doesn't rely on some trick interpretation of the question. I built a logic gate structure based on supercat's textual explanation (given in user2357112's answer and Gamow's comment); trace it at your leisure. It's a good thing we are given an infinite supply of AND and OR gates. Edit: Added annotations. Expand the image if they are too small. Other edit suggestions are welcomed! Solved over at http://electronics.stackexchange.com in the link provided by Gamow in the comments. This is a direct quote of supercat's excellent answer; go upvote that. It is possible to construct a purely-combinatorial three-input circuit consisting of a number of AND and OR gates along with exactly two independent inverters, with three outputs whose steady-state condition will be the inverse of the inputs. Note that the input to the second inverter will be affected by the output from the first, and that all three outputs are affected by the signals from both inverters. Consequently, one cannot use two of the inputs and outputs of one such circuit to serve as the "inverters" for another. Assume the inputs are A, B, C and the outputs are X,Y, Z. 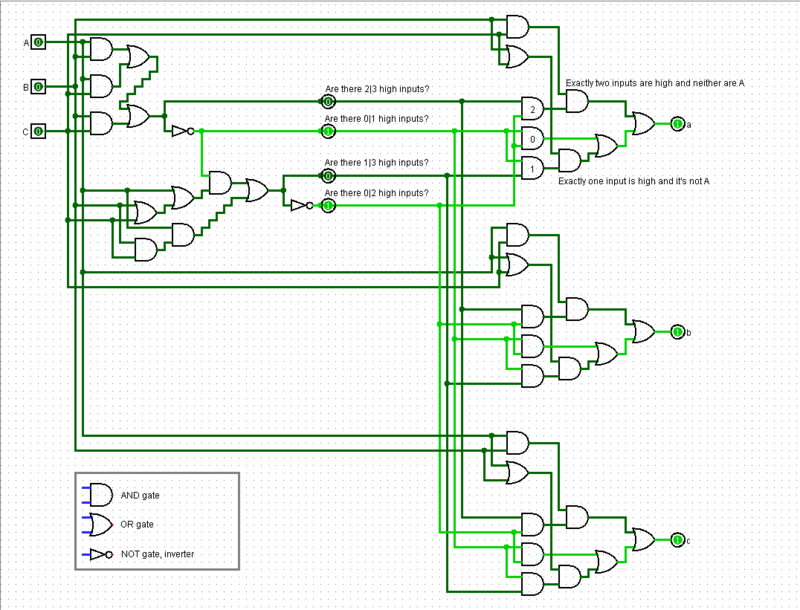 Using AND and OR gates, determine whether at least two of the inputs are high. Invert that to get a signal which would indicate that at least two are low. Feeding that signal along with the original signals into AND and OR gates, generate a signal which would indicate that an odd number of inputs are high. Invert that to get a signal saying that an odd number are low. Once one has generated the aforementioned signals, output X should be high if either all three inputs are low (both inverters outputting true), at least two are low and either B or C is true (which would imply that A must be false), or at least one is low and both B and C are true. Outputs Y and Z should be computed similarly. The principle can be extended to produce a seven I/O combinatorial circuit using three independent inverters and a lot of AND/OR gates. First determine if there are four or more inputs high. Invert that to say there are four or more low. Then determine if the number is 2, 3, 6, or 7. Invert that to say there are 0, 1, 4, or 5. Then determine if the number is odd, and invert it to say it's even. After having done all that, each output Q should be high if all three inverters output high (all seven inputs low), or if the first two inverters are high and at least one input not associated with Q is high, or the first and last inverters are high and at least two inputs not associated with Q are high, or the first inverter is high and at least three inputs not associated with Q are high, or at the second and third inverters are high and at least four inputs not associated with Q are high, or the second inverter is high and at least five inputs not associated with Q are high, or the first inverter is high and all six inputs not associated with Q are high. Theoretically, one could design a circuit for 15 I/O's using four inverters, or 31 using five, or 63 using six, etc. but the number of AND and OR gates required would be mind-blowing. Not the answer you're looking for? Browse other questions tagged logical-deduction circuitry or ask your own question.